Having problem applying your bay window curtains? Don’t know what to do to the bay window? Well, keep reading this page. I’m pretty sure you’ll get inspired by the ideas and inspiration we’ve got here just for you. First of all, you’re probably wondering why choosing bay window if it’s keep having a problem with curtains? Well, some people have a problem finding the most suitable design of curtain for their bay window because some people think that a curtain could disturb the beauty of the outdoors that we see from the bay window. Bay windows somewhat produce a spectacular sight. When you see from the outside, you’ll enjoy the ornamental look of the three-dimensional frame that decorates the exterior of the house. From the inside, it becomes the perfect nook for sunrise excitement. This kind of windows is perfect for living room or parlor. The windows’ width lets the generous amount of light, right into the room which makes the room appear to be larger and more spacious. 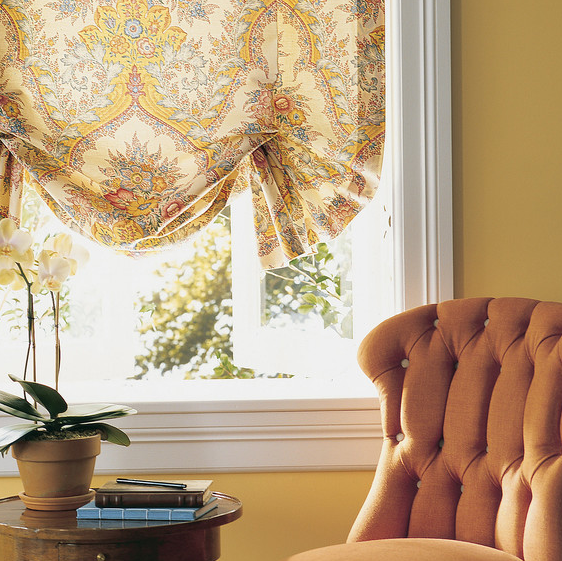 There are two popular options you can choose to cover your bay window, either you choose curtains or blinds. 8 Pros and Cons ! There are many choices you can have when dealing with curtains for bay windows. The good thing about curtain is that it won’t overshadow your bay windows. You can go with a single track or curved tracks. Many people choose the single track because it’s simple but effective. The curtain would be drawn across the bay’s front. 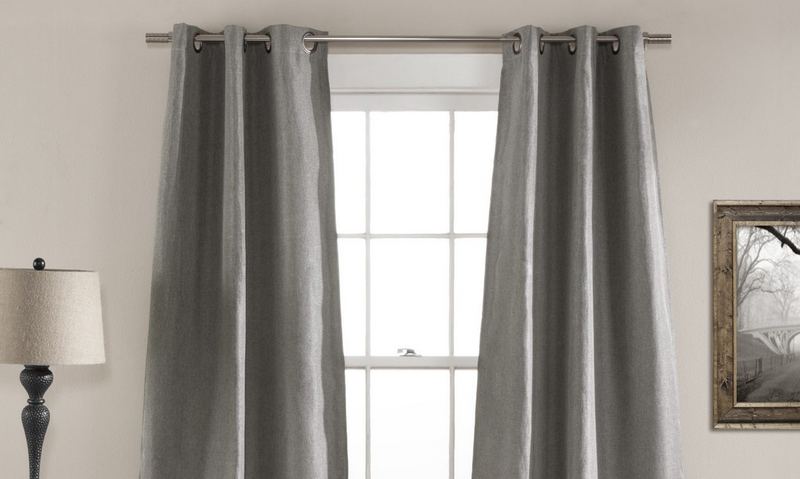 This curtain would cover the whole window space without even bother cluttering the bay with more curtains. If you want to make sure the space under the windows, you may need to have the bent or curved tracks. This curtain will sit inside the bay space, so you can eliminate the gaps in your bay window with all the drawn curtains. 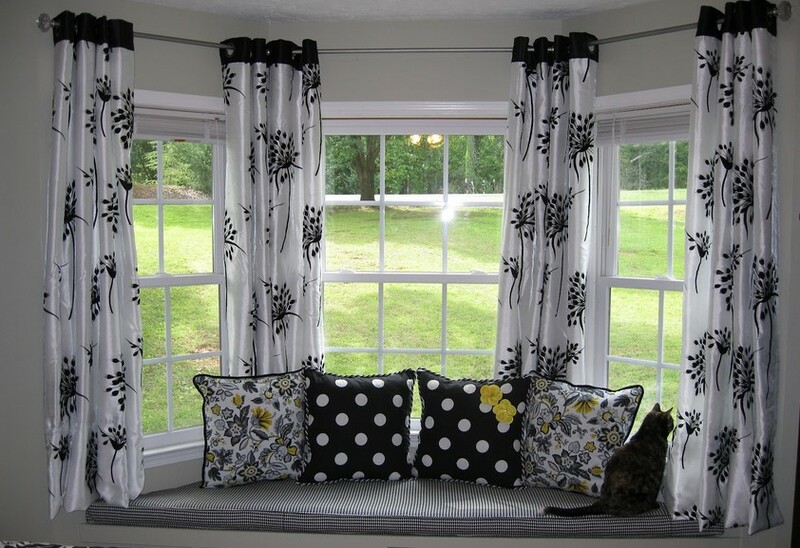 if you need some inspiration for treating your bay windows, here are some effective solutions to bay window curtains. This can be the perfect treatment for the bay window. The term “cafe” may not mean much to the use of the curtain itself if you are not in the industry of decorating. This curtain only hangs partway up the window, just like the cafes on the roadside used to have. You can put at any scale of your bay window. It can be hung halfway up the window, closer to the bottom, or nearly at the top of the window. You can match it to the dividing line that already in the window. This curtain would be a sweet compromise to your window. There’s no other flexible option for your bay window but classic. You don’t have to design your windows to be too decorative. You can just decide to leave it unornamented. It would be the most majestic part of your home. Applying classic vertical shades into the bay window appear to be sophisticated and sleek. It simply just pulls it down for privacy and leave it up for a showcase. Dealing with this kind of curtain, you won’t need much color or decoration, just leave it as the way it is. The look of bay windows is vaguely medieval. That’s a good reason to play it up. Check out this formal treatment for the bay window. It looks lushly elegant and perfect for a luxurious parlor. It could be a good spot for you to write your journal or just read some books. Complete it with a nice formal single couch and a side table. This ornamental shade that covers your window would look lively. A curtain doesn’t have to go on sides, it could go up like this one. The whole space of the large bay windows can be used as one room. In the picture, a dining room is set right beside the large bay windows. It looks perfectly suitable because of the large space of the house, obviously. The dining room beside bay windows would offer a morning breakfast that is brightened by outdoor’s light. 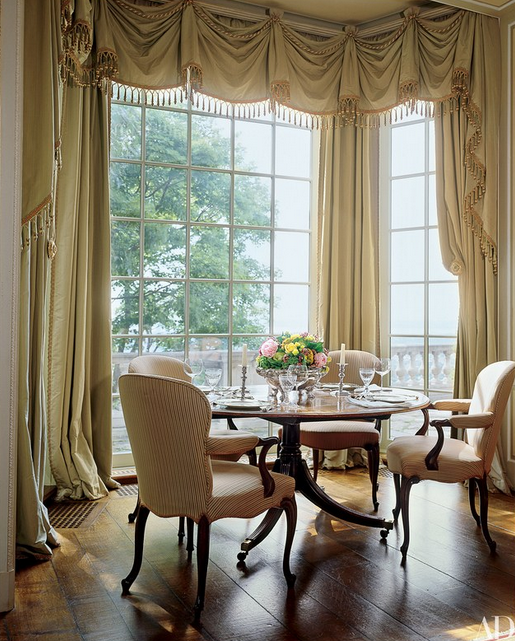 The antique curtains itself is designed by David Easton. It really matches with the atmosphere that the room already has. If you are into floral patterns, this is the one you deserve. Take a look at these thin panels. It’s perfect for the bay windows that you want to have a vintage look. This colorful treatment features some bold floral prints in coordinating colors. These printed panels are ready to cover your bay windows and create a beautiful light that goes through them. You can increase the country or vintage feel by using a small ring and a narrow iron pole to hang the fabrics. 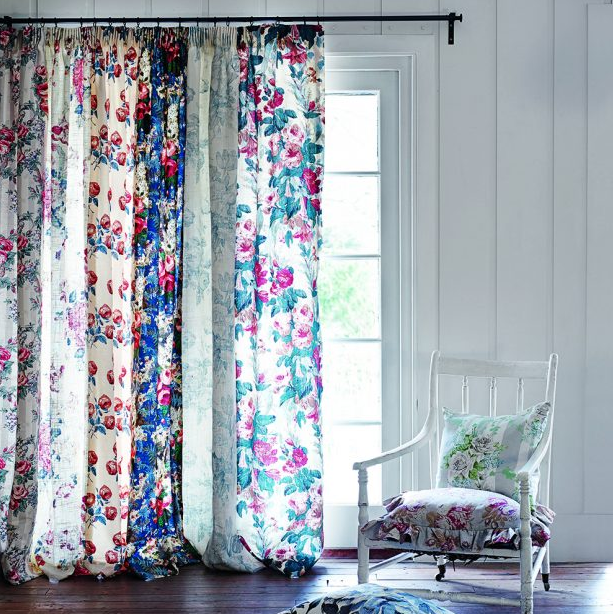 This can be one of the most favorite bay window curtains. It’s perfect for your summer decorations, especially if you have a nice tropical view outside the bay windows. This kind of curtain is a laid-back solution for any windows with large size. It’s got a subtle print that accentuates the light of the bay windows. Also, this curtain is easy to remove, you can just untie the tabs and replace it with the new one. The fabric materials need to be lightweight and thin in order to create a perfect appearance. 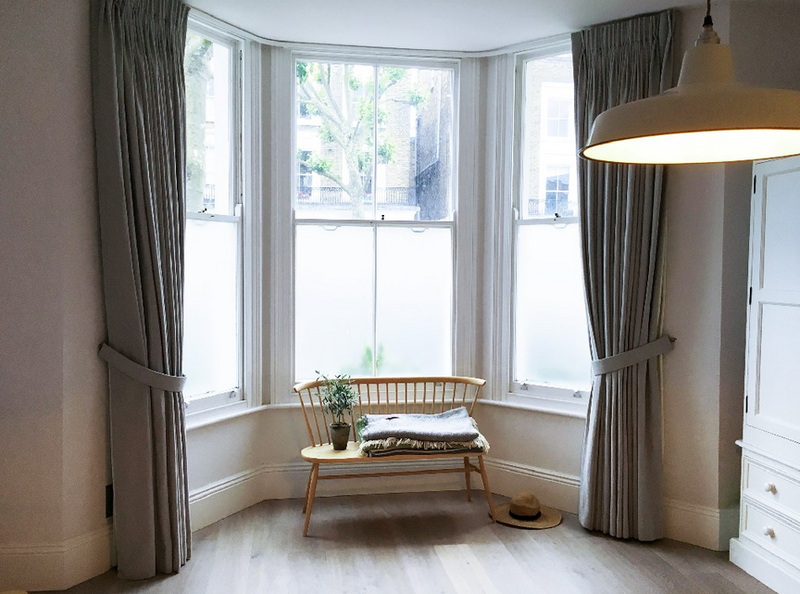 Here are some pros and cons of having curtains for your bay windows. It’s gathered according to people’s opinion. Flexible to any type of window. Make your window more decorative. Create a perfect shade of light. Stylish and go well with any styles. Sometimes, it’s a bit complicated to install. Can be cluttering all over. Mostly, it only covers the one side to the other. You have to be clever in deciding which one is the best treatment for your bay windows. 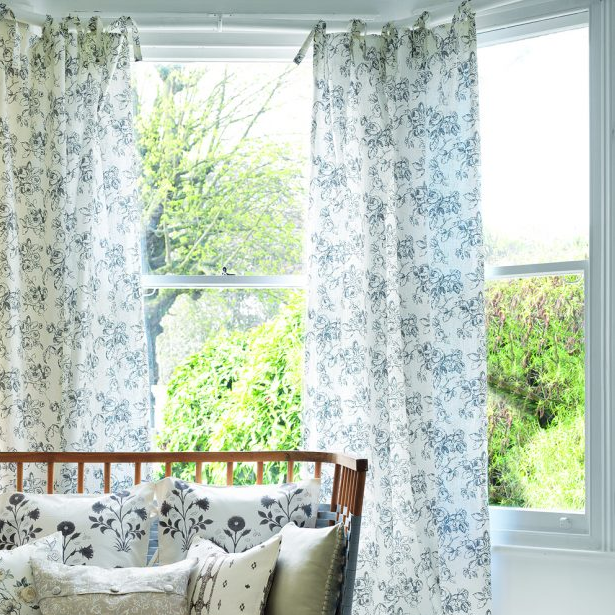 Sometimes, people get confused whether to choose curtains or blinds for their bay windows. Well, it’s all according to the purpose. If you want to make your bay window a lot more interesting and decorative, you are gonna need some ideas of bay window curtains.